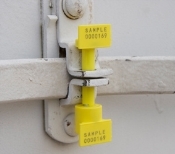 The SnapTracker Bolt Seals are a barrier class security seal, designed for securing high value cargo. A solid steel bolt provides strength while a molded plastic coating provides tamper-evidence. **These high security bolt seals meet the ISO 17712:2010 standard.